In a lingering opening the three Uchenna Dance (UD) performers, Shanelle Clemenson, Sheila Attah and Habibat Ajayi, emerge slowly on their knees into a silvery light with foreheads kissing the floor. They each tie around their heads part of a 10m x 3m patchwork of patterned and printed material and as their undulating backs glacially retreat stage left they use their heads to unfurl a giant head wrap. The relative stillness of the image draws the audience towards the bodies and the head wrap as sombre echoes of history, women and colour are united by hair. With over a dozen self-contained chapters exploring female beauty, empowerment and relationships across generations, The Head Wrap Diaries is sprinkled with humour, lightness and empathy. 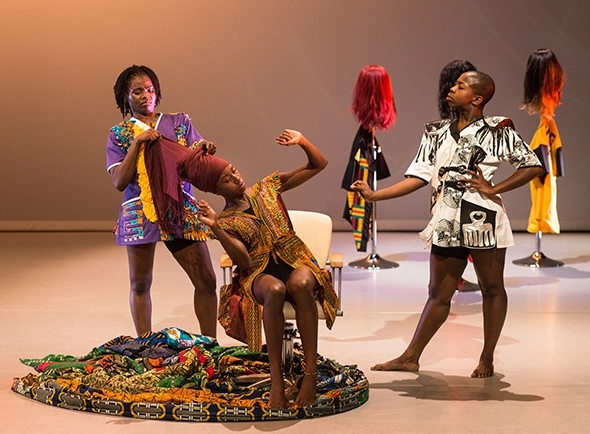 Clemenson, Attah and Ajayi adopt multiple personalities that melt choreographically between the vocabularies of waacking, house, contemporary and African people’s dance set by UD’s artistic director, Vicki Igbokwe. (If you want to know more about the motivation and some of the insights for The Head Wrap Diaries see my companion piece which I wrote as the work was being created). The tone and pacing across the evening is well crafted as the chapters shift between solo characters, fierce dancing and clear movement direction. Attah’s detailed portrait of Auntie Florence in her hairdresser’s chair, (wo)manspreading, hutching up the hem of her dress and delivering a perm monologue in a booming Nigerian voice with oodles of inflexions and pitches, has the crowd in howls of laughter. From a single arm and face raised high echoing, “We give thanks, we give thanks” to “How old am I? How old are you?” the front row of the audience almost erupts. Clemenson’s wide eyed death stare and swift head shake as she commands a reluctant Ajayi to sit between her legs and prepare for the mother of all hair brushings is a parody born of experience. Ajayi’s quivering legs, splayed toes and tensed fingertips create memory triggers and bodily reactions in the audience. I’m surrounded by the voices of mothers who share with their neighbours: “Too true, too true,” and “Perhaps I shouldn’t do that to my daughter.” These stories, communities and histories are culturally rooted across decades, continents and politics; it is testament to Igbokwe’s authentic and humorous portrayal of black, female experience that the crowd responds with such vocal relish. Scenographically there are two fixed hairdressing chairs, three wig stands and a large screen positioned upstage on which a number of black female hairstyles and portraits are projected. The screen feels unnecessary, not only because the images are often partially bleached out by the lighting but the screen content can draw attention away from the dancers. This material might sit better as an accompaniment to the pre- and post-show foyer installation that includes head wraps for sale, newly commissioned art work, organic tea, photography and dolls, all of which aided the understanding and engagement of the work, framed the performance and ensured the audience had a hands-on (and heads-on) experience. Apart from the two hairdressing chairs there are seven others placed stage left; at the beginning of the performance two audience members are invited to sit on the chairs to have an alternative perspective of the performance. When Attah, in the role of a travelling saleswoman, demonstrates step by step the art of putting on the head wrap, Clemenson and Ajayi follow her instructions but the two unsuspecting audience members need a lot of encouragement to try; after calls from the audience to “tuck, tuck,” they too are crowned. This is one of the few hands-on moments of interaction between the cast and audience; it is an element that has the potential to grow, to bring more people on stage and to create the melee and buzz of a hairdressing salon: an ideal opportunity for UD to work with an extended cast. The Head Wrap Diaries is a hair piece but it is also a dance piece and when the choreographed sections arrive they land with ferocity. Attah, Ajayi and Clemenson’s head-snapping faux self-importance, all fill the stage with swag. Together they cat walk, strut, waack and are constantly up on their toes with lean calves giving elasticity to their steps. This strut bouncing embellishes their characters, accentuates their rhythm and pays homage to the Queen of the New Jack Swing, Janet Jackson. With only two English venues on the tour, the increasingly conservative and monochromatic choices by UK dance venues is a real concern. Here is a work that is engaging, authentic, culturally rooted and beautifully danced with an intelligent installation and (head)wrap-around programme. With a society crying out for cultural understanding, it is no longer acceptable for programmers to think they already have their one ‘black/disabled/trans’ artist for the season and can’t programme another. Never mind Arts Council England’s Creative Case for Diversity, The Head Wrap Diaries is great dance for all.